Tommorrow is the last day of Clergy Appreciation Month, an annual observance to honor pastors and others who “labor in preaching and teaching” (1 Tim. 5:17). In recognition of their contribution, here are nine things you should know about pastors in America. 1. The observance of a Pastor Appreciation Day (the second Sunday in October) began in 1992 when Jerry Frear Jr., founder of Under His Wing Ministries decided that “if secretaries could have their own holiday, so could clergy members.” He began lobbying state legislatures and now seeks a presidential proclamation. The name of the unofficial observance was later to changed to Clergy Appreciation Day and expanded to include all of October as Clergy Appreciation Month. 2. There are no reliable figures on the number of clergy in America. In 2012 the Yearbook of American and Canadian Churches reported that there were 600,000 clergy serving in various denominations in the U.S. But that figure included retired clergy, chaplains in hospitals, prisons and the military, denominational executives, and ordained faculty at divinity schools and seminaries and did not include independent churches that are not connected with a denomination. The Bureau of Labor Statistics has an even more peculiar estimate, claiming that only 46,510 Americans are employed as clergy. 3. Many full-time pastors receive some mix of compensation that includes a base salary, housing allowance, health insurance, and retirement. A survey of senior pastors (i.e., the lead pastor in a church with multiple paid pastoral positions) found that the compensation tends to vary based on a number of factors, including church income, region, weekly attendance, years employed, etc. The national average for full-time senior pastor compensation in 2013 was $88,814, but drops to $79,520 when solo pastors (i.e., the sole minister in a church) were included. 4. Relatively few pastors give up on ministry. A survey of pastors of evangelical and historically black churches found an estimated 13 percent of senior pastors in 2005 had left the pastorate ten years later for reasons other than death or retirement. Two percent shifted to non-ministry jobs, and 5 percent stayed in ministry but switched to non-pastoral roles. Combined, those two groups account for known losses of less than 1 percent a year. 5. For senior pastors who have left their church, the main reason is change in calling (37 percent). Conflict in the church is the second most common reason at 26 percent. Other reasons pastors have left the pastorate include family issues (17 percent), moral or ethical issues (13 percent), poor fit (13 percent), burnout (10 percent), personal finances (8 percent), and illness (5 percent). Lack of preparation for the job was cited in 3 percent of cases. 6. Many pastors are stressed about money and the demands of ministry. A survey found that 54 percent find the role of pastor frequently overwhelming, 53 percent are often concerned about their family’s financial security, 48 percent often feel the demands of ministry are more than they can handle, and 21 percent say their church has unrealistic expectations of them. 7. A survey of Protestant pastors found that nearly 1 in 4 pastors (23 percent) have personally struggled with a mental illness such as depression, while 12 percent say they’ve received a diagnosis for a mental health condition. 8. Protestant pastors reported working between 42 and 63 hours per week, according to a survey of what clergy do during the week. Of all clergy surveyed, a third of their time (33 percent) is spent preparing for preaching and worship, 19 percent on providing pastoral care, 15 percent administering congregation’s work and attending meetings, 13 percent teaching and training people for ministry, and 6 percent in denominational and community affairs. An additional 7 hours is spent on prayer and meditation and 4 hours on reading other than for sermon preparation. As a man who is easily taken “out of the zone,” interruptions are something I find difficult to appreciate. Said more honestly, it is hard for me not to disdain them. However, since I live in God’s world under Christ’s rule, I understand that my scorn for interruptions is not OK. Even the idea of interruptions is suspect when I live at the pleasure of another who is Sovereign over all. God has created me in Jesus Christ to do the good works He has prepared for me to do, not necessarily the ones I have planned to do (Ephesians 2:10). The Lord will interrupt my self-made plans with His own. I need to learn and love that truth. I not only need to pray, “Thy will be done,” but I also must practice it when His holy interruptions come my way. 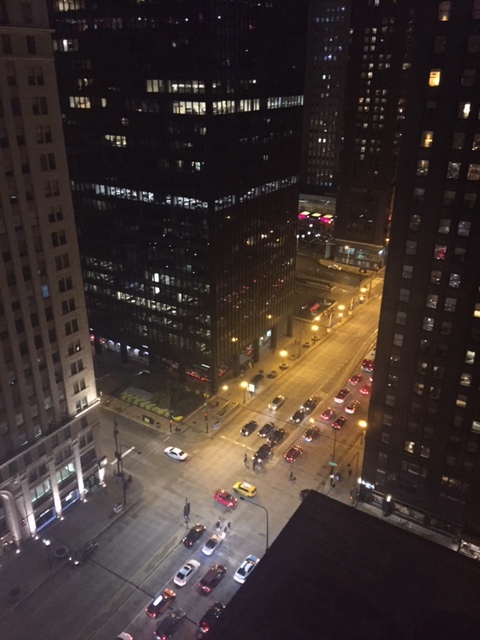 In Chicago For the Weekend! The local church was always at the center of Dietrich Bonhoeffer’s heart and theology. In his studies he wrote his first dissertation on life in the church (“The Communion of Saints: A Dogmatic Inquiry into the Sociology of the Church”). As a theological professor he labored to train pastors for the church. And in his later writings, he often returned to muse on life together in the local church. 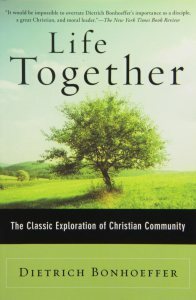 It’s this subject that entitles one of his most famous works, Life Together, posthumously subtitled, “The Classic Exploration of Christian Community.” Coming in at 122 pages, Life Together is not a long book. But it is one that invites you to think deeply about God’s design for his people. Overflowing with wisdom, you will run your highlighter dry if you are given to marking up books. As I continue to share with you some of the things God spoke to me about whilst on sabbatical, I want to focus this week on the important but often neglected tool (or, in old money, discipline) that is meditation. It’s amazing how, as I write the word meditation, my mind drifts swiftly to images of people with crossed legs, chanting some repetitive religious mantra. Why is it that, as Christians, we so quickly lose sight of the central place that biblical mediation has played in the lives of our forefathers (and mothers) for the last two thousand years? Take for example Dietrich Bonhoeffer, a German pastor who was executed by the Nazis. When asked why he meditated he replied, ‘Because I am a Christian’. In addition to the witness of so many in the church over the last 2,000 years, we find the practice of mediation used by those faithfully following the Lord again and again in scripture – at least 55 times in the Old Testament alone! Find examples in Genesis 24:63, Psalm 63:6 and Psalm 119:148. So what is biblical mediation? Richard Foster describes biblical meditation as ‘very simply, … the ability to hear God’s voice and obey his word‘. How does it differ from just reading the Bible?